A couple of weeks ago Russ Maher flicked me a question via twitter whether it was possible to include a Lotus Notes mail signature in a Meeting Invitation. Initially I thought this was going to require a major hack of the mail file. 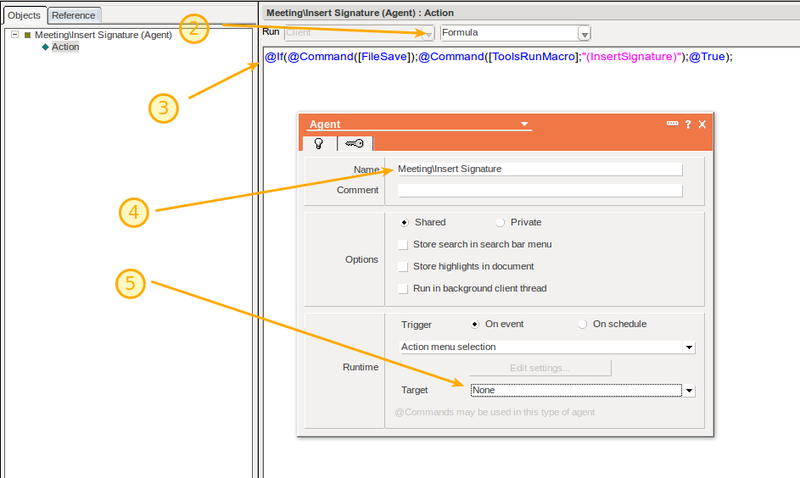 However, further investigation revealed an agent in the mail database design that I hadn't really noticed before; it's called - interestingly enough - "(InsertSignature)". Guess what it does? Yep ... it inserts the signature into the current document from your Mail Database preferences. From the Create menu, choose Agent and change Change the Agent Type to "Formula"
Make sure the agent property for Target is "None"
Save and close the Agent. You have to have Designer access with the "Create Agents" role in the Mail Database ACL. If you're not sure what this means, or if you can't follow the instructions above, it's pretty likely that your Admin doesn't let you create agents. In that case, ask them very nicely to read this post and do it for you. That's it. 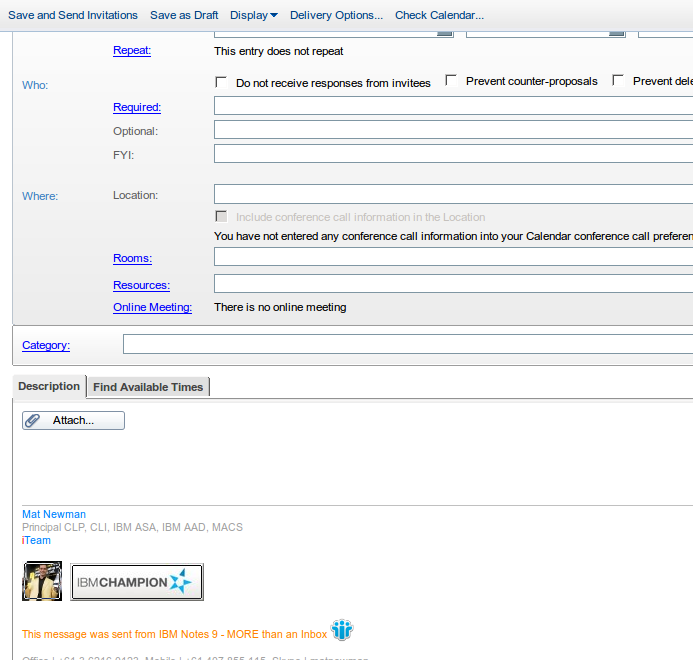 Next time you create a meeting invitation, all you have to do is click in the meeting Description, then select the Agent from the Action menu to insert your mail signature into the meeting invitation. Choose "Ok" to close preferences. 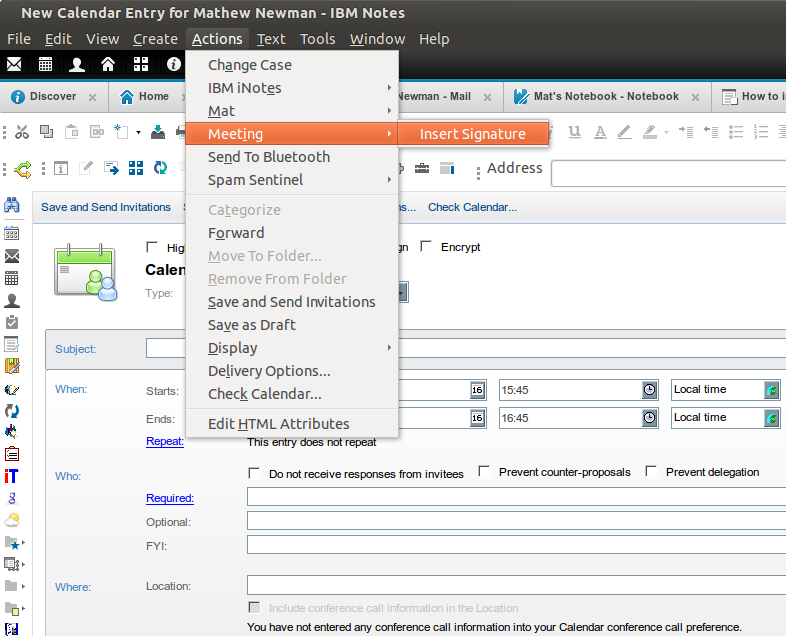 If you can't see your toolbar at step 1 (above) in IBM Notes 9, Choose "View"->"Toolbar" and turn OFF "Show Toolbars Only When Editing"
Now you can click this button whenever you are in a meeting invitation which will insert your mail signature in the Description section of the invite. Awesome find and thanks Mat! One issue I did run into is that I had to change my signature to Rich text from HTL file but then your solution worked like a Champ! I found a bug in doing it this way. The meeting document is saved. So if you, after inserting your signature, decide to not create this meeting and hit Escape, the meeting document is still saved and will show up in the calendar. Now you will not get the problem with the document being saved if you decide to abort. I am extremely new to NOTES and currently have an HTML from a signature generator that IBM offers. I set up the agent and everything works...there is a slight problem though. The signature that it uses is an older signature with outdated information (address, phone number, etc. 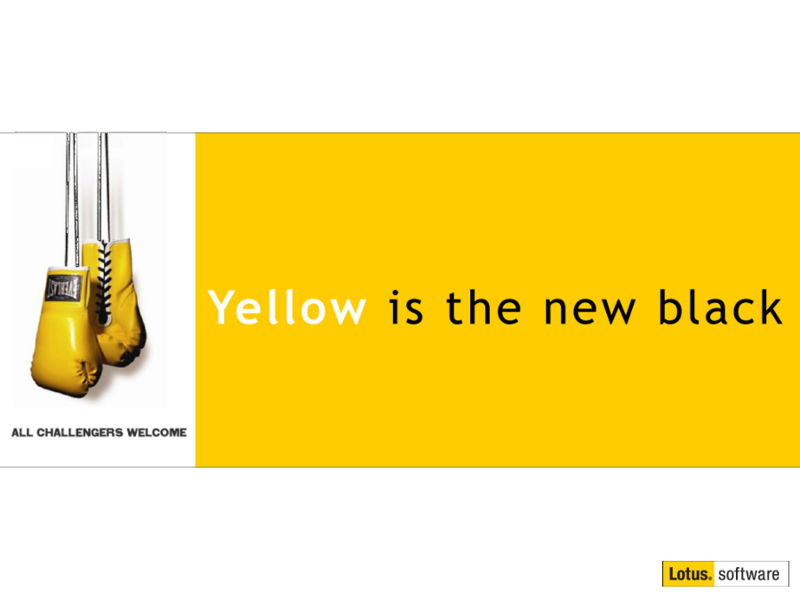 ), do you know how to find the signature that it's using and make the necessary adjustments? Do you know how to remove a image pasted into the rich text signature via designer as I cannot access the user preference as it gives an error message "warning ignoring portion of document that uses a feature from another version of notes"
I tried a lot of things over the months but in the end just created a new .nsf and copied the emails into it which is hell with large folder structures and file etc?